Can IPS THINERGY Thin-Film Micro-Energy Cell (MEC) Automatic-Recharging Battery Technology Power the Future Soldier/Warfighter? | DefenseReview.com (DR): An online tactical technology and military defense technology magazine with particular focus on the latest and greatest tactical firearms news (tactical gun news), tactical gear news and tactical shooting news. Can IPS THINERGY Thin-Film Micro-Energy Cell (MEC) Automatic-Recharging Battery Technology Power the Future Soldier/Warfighter? A company called Infinite Power Solutions (IPS) has apparently developed a a range of “revolutionary” small, ultra-thin solid-state thin-film rechargeable batteries called THINERGY Micro-Energy Cells (MEC) that could potentially represent a viable solution to powering future soldier/warfighter hardware and technology, including weapons accessories and advanced electronic devices like wearable computers and keypads, helmet sights, exoskeletons, etc., provided it proves legitimate and viable. It’s well known that one of the major impediments (besides excessive weight increases) to future soldier/warfighter technology/hardware programs has been the ability to provide enough sustained battery power. What makes a THINERGY Micro-Energy Cell rechargeable battery different from standard rechargeables is that it’s capable of at least partially recharging by directly harvesting energy from ambient heat and power sources, including solar, thermal, RF, magnetic and vibration energy sources, without the use of cables/chords. DefenseReview assumes that Thinergy MEC batteries’ ability to harvest energy from vibration means that they can recharge automatically via any type of kinetic movement, similar to an automatic mechanical watch/wristwatch. 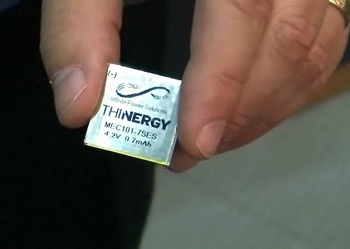 According to the company’s website, Thinergy MEC products are “able to operate in temperatures ranging from -40ºC to +85ºC, the IPS ultra-thin MECs offer extremely low self discharge rates, low cell resistance, and high power–making THINERGY the industry-leading micro-energy storage offering.” The company’s website also claims that Thinergy Micro-Energy Cells deliver a “safe, reusable and clean power source” for electronic devices and systems, meaning that they’re a “green technology” that’s non-toxic and uses less resources than standard batteries, including standard rechargeables. The two technological keys to the IPS Thinergy MEC automatic-recharging battery tech are rechargeable battery tech and ultra capacitor tech, which Thinergy combines. The Red Ferret Journal reports that Thinergy Micro-Energy Cell batteries can be made as small as 12mm² and 0.2 mm thick, which is approximately half the size of a postage stamp. They can reportedly be recharged to 90% capacity whithin approx 8 minutes, and can be fully charged 10,000 times or partially charged (shallow-cycle charged) 100,000 times. Click here to view the “Thinergy Micro-Energy Cells” video from Engineering TV. Can Infinite Power Solutions Develop a larger body armor plate (SAPI/ESAPI/XSAPI)-sized Thinergy Micro-Energy Cell that can be integrated with infantry soldier/warfighter body armor to power Land Warrior, Future Force Warrior (FFW)–formerly Objective Force Warrior (OFW)–and Future Warrior-type “Soldier as a System” on-the-body and on-the-weapon hardware/technology? Maybe. Defense Review plans to investigate it, and report back–so stay tuned! Previous: F-35 Lightning II Joint Strike Fighter (JSF) Too Expensive? Solution: Scrap the F-35A and F-35C Variants, Produce the F-35B STOVL, and Revive the F-22 Raptor.